Getting your garden through summer can be tough. All of the stresses a plant can be subjected to are magnified by the heat, drought and increased humidity of summer. Summer heat can come on quickly on the Gulf Coast. It can seem as though we move from late winter to spring to full blown summer in a matter of weeks. There are some techniques we can employ that will reduce summer stress in our gardens. Some should be put in place well before summer temperatures begin to rise. Others can be employed any time stress is evident. Soil that has adequate organic matter holds more water after rain or irrigation, and releases it back to the plants more efficiently. The organic matter acts like a sponge. 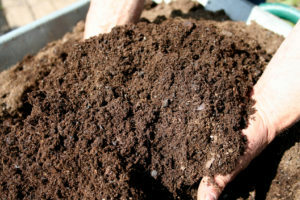 The best form of organic matter is compost. Work to achieve a minimum of 5% – 10% in lawn areas, 10% – 25% in ornamental beds and orchards, and 25% – 35% in vegetable and small fruit beds. Not all compost is created equally; buy a quality product. Improving soil texture should be a long term goal and a continual practice. Remember that these materials need to be replenished annually in most of the garden, depending on decomposition rate. In the vegetable garden and where annual color is replaced several times a year, compost should be replenished between crops. Following a consistent organic program supports the soil food web – the biosphere of beneficial macro- and micro-organisms that works with plants to provide nutrients and decrease soil borne pathogens. Regular applications of a balanced organic fertilizer such as Arbor Gate Organic Blend, MicroLife 6-2-4 or MicroLife Ultimate are the foundation of this program. Other supplements such as greensand, rock phosphate, and other minerals can be added if deficiencies are identified, or for plants that have specific requirements. A consistent organic program will keep your plants healthier year-round, which will help them deal with both summer stress from heat and drought and winter stress from cold and drying winds. Mulch serves a number of purposes, one of which is keeping the soil cooler in the summer. A 3” layer of organic mulch can reduce soil temperatures by as much as 25° – 30° F, according to local soil scientist and mulch expert John Ferguson of Nature’s Way Resources. That’s a LOT of temperature moderation. Mulch also reduces evaporation, so the supplemental water you apply will be more effective. You can apply mulch anytime, but summer is the worst time for the gardener’s comfort – it’s a hot chore. It is best to apply mulch in one of our cooler seasons. However, if I did not have mulch on a bed, I would bite the bullet and get out there in the cool of early morning or late evening to spread it before I would let the bed bake for the summer. John recently completed a series of articles about mulches in the Lazy Gardener Newsletter. You can access the archive of these articles or sign up to receive the newsletter at here. It goes without saying that natural rainfall is best for a garden. The greater Houston area receives sufficient annual rainfall to sustain a garden – if only we could just regulate when it fell! But we have a sort of feast-or-famine cycle of rainfall. All gardens will require supplemental water from time to time. Infrequent deep soakings are better for a garden than frequent shallow watering. Shallow watering on a regular basis encourages the roots to develop up in the zone that is subject to drying first. There is a lot of discussion about what time of day is best. My general opinion is that the best time is when YOU have time, but if you have the option, early morning is best. It’s cooler then so there will be less evaporation. The water will be available when the plants need it most in the heat of the day. Water will dry off the leaves quickly, decreasing the likelihood of promoting fungal diseases. If we have followed all of the practices above, our plants will be healthier and more resilient, but things can go wrong in the best of circumstances. If you have not yet taken the above steps, you still have to get through this summer. You can spend some time amending the soil and mulching this fall and winter. In the meantime there is a “tonic” that assists plants through their heat stress – a combination of Epsom salt, Liquid Seaweed (kelp), and SuperThrive®. Despite the name, Epsom salt is not a sodium salt like table salt, but rather a source of the minerals magnesium and sulfur. 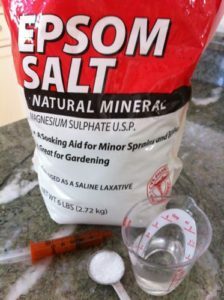 Gardeners have used Epsom salt for decades and it has many uses in the garden. Magnesium plays a crucial role in photosynthesis – the process by which the plant converts light energy into chemical (food) energy. There are some exaggerated claims about Epsom salt out there. We can weed those out from its practical applications and use it in a common sense way. Seaweed (kelp) provides roughly 60 trace minerals plus amino acids and enzymes. It enhances root development, stimulates microbial activity, and promotes the production of auxins (natural plant growth hormones). 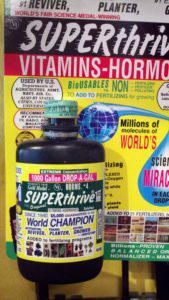 SuperThrive® is a combination of vitamins and plant hormones. It is not a stand alone fertilizer but can be added to fertilizers. It is well known to reduce transplant shock. Two-thirds cups is based on a recommended application rate of 2-Tbls per gallon of water of the Liquid Seaweed and Epsom salt – 1/3 cup is 5-1/3 Tbls. If the products you use recommend more or less than this, adjust as required. You can substitute Garrett Juice for the Liquid Seaweed but you will need to increase the amount to 1.1/4 cup per 5-gallons. Garrett Juice has compost tea and horticultural molasses as well as seaweed. Water your plants thoroughly the day before application. Then apply the tonic as a drench, wetting the root zone of the plant. 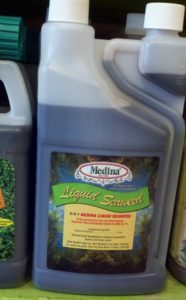 You will use ½ – 1 gallon for shrubs, and less for perennials, vegetables and bedding plants. It will take several days to see results. How often to apply depends on how stressed the plant is, how long the heat lasts, and the general health of the plant in the first place. Container plants may benefit from using this tonic weekly, but if you choose to do this, dilute it by half with water. This follows the “weakly, weekly” practice and can keep easily stressed plants, like root-bound ferns, happy through the summer. With any supplement, there is a tendency to think that if a little is good, more is better. We do have to remember that any excess we apply can leach out of the soil and end up in the watershed. It is best to apply conservative solutions on a regular basis rather than a large amount all at once.